One more week with the crutch and brace, says my therapist. Still have to limit time spent on my feet. 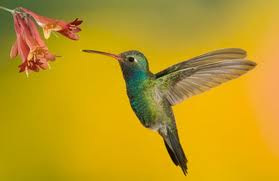 But, I am seeing some improvement from when I began the therapy. "Have a dream, make a plan, go for it. You'll get there, I promise." 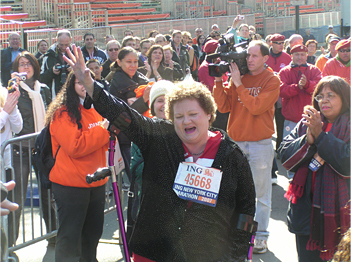 Said by Zoe Koplowitz, Achilles Track Club member with multiple sclerosis and diabetes, after finishing the 1993 New York City Marathon, on crutches, in over 24 hours. Koplowitz has completed every New York City Marathon since that first one, plus Boston and London, all in over 24 hours, for a total of 22 completed marathons. She continues to be an inspiration to all who hear her story. New York 1993 was my first marathon. After awakening the next morning, terribly sore but immensely happy, after having my coffee and a big post-marathon breakfast, I remember watching the news on TV in my hotel room in New York, and seeing this incredibly brave woman, Zoe Koplowitz, on crutches, surrounded by the New York City Guardian Angels, slowly, deliberately, walk across the finish line in Central Park. I am sure she too was.. "terribly sore but immensely happy." I pulled out my Boston Marathon book tonight--Hal Higdon's 1995 Boston. It tells the history of the running of Boston, with all the great runners and great races there. I reminisced about the years I ran Boston, and the time I met Boston Marathon great, Johnny A. Kelley. 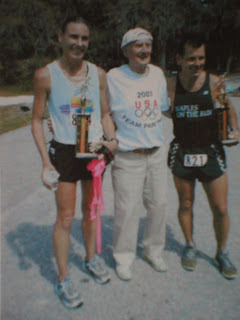 In early 2002, I ran, and won (women's overall) a 50k over in Sarasota, the Knight Trail 50k. Johnny Kelley and his wife used to winter in Sarasota, and the race directors had persuaded them to join us for the post-race picnic they put on for us. He was there to greet us as we crossed the finish line. His running advise to me? The Finns told him to "start your workout with 300 yards or so of fast walking, then jog at an easy pace and slowly build up to your faster running." Kelley won Boston twice, in 1935 and 1945; came in second seven times; and placed in the top ten 18 times. He continued to run the full marathon up until 1992 at age 84. Out of 61 Bostons he started, he only dropped out three times, for a total of 58 finishes. 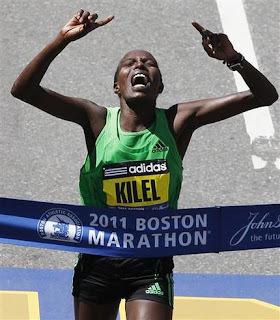 Boston Marathon 2011 - Wow! 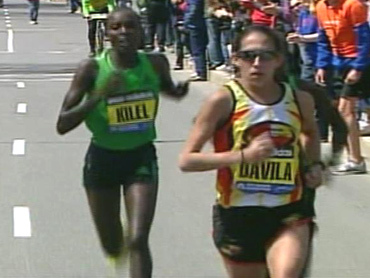 Women's race - American Desiree Davila back and forth with eventual winner Kenyan Caroline Kilel, 2:22:36 and 2:22:38! 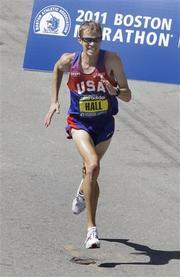 American men's record broken by 40 seconds - by Ryan Hall in 2:04:58! 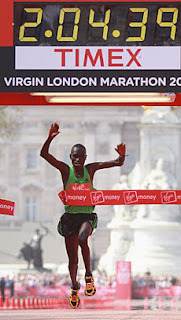 In today's 31st running of the London Marathon, with more than 35,000 participants, the course record for men was broken. 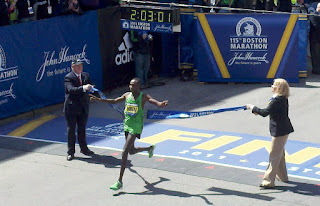 Kenyan Emmanuel Mutai came in at 2:04:39. 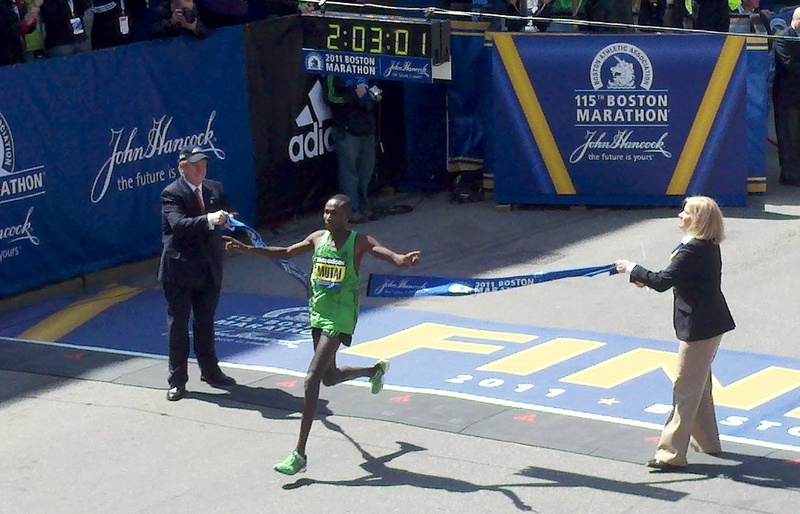 That's a 4:45 min/mile for 26.2 miles. Can you imagine running like that?! 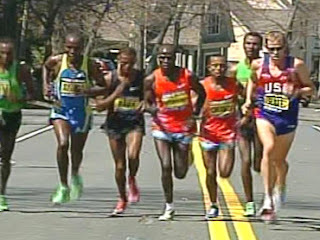 The top three in the men's race were all under 2:06 and all three were from Kenya. On the women's side, another Kenyan, Mary Keitany, was first with a time of 2:19:17. That's a 5:19 pace. 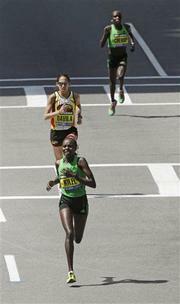 The top three women were all under 2:21. What amazing athletes! And what's really cool is... that when you participate in a big city marathon like London, or New York or Chicago or tomorrow's Boston, you get to run on the very same course that the elite athletes do. I found this video on YouTube.. It takes you from start to finish of the Boston Marathon course in eight minutes... driving (of course), and in fast motion. As I watched it, and it went on and on, I remembered the times I ran it. 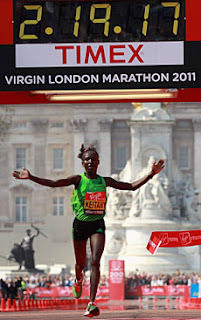 Congratulations to all who ran London today! 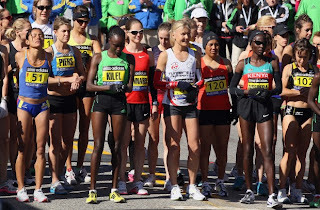 And to all who will run Boston tomorrow, hope you have a great time! Hmmmm... I wasn't expecting this. And I forgot. I guess I should have known better. That it was going to be slow. The road back. I forgot that I had to get my regular gait back, that it wasn't right. And last time, the last surgery, where I just had the diseased lining and loose bodies that needed removing... no labral tear... it took at least a month just to do that. This time... the repaired labral tear needs to heal before we can even begin to work on my gait. The muscles of my hip and thigh are so weak and so hurt. In PT I am doing just the smallest of movements with those muscles... and I can barely do it! My leg starts to shake. It's getting hot and humid out there--summer is right around the corner here in So FL! I finally had surgery on my hip last Wednesday. I saw my surgeon this morning; he said it all went very well. He removed 16-17 little loose "bodies" and the inflamed lining. I also had a labral tear (tear in the ring of cartilage around joint cavity) that he repaired. I'm on crutches and have to wear a brace that keeps my leg from abducting or extending back too far. I am also not supposed to internally rotate my leg (the labral tear was in the inside front area). Physical therapy will begin next week--dr said six weeks, then another six weeks of more intense PT. Then... I can begin to get back to my running! Yay! My runners are doing great. Several of them ran a local 10k this past weekend and I wanted to go. But my husband had a terribly bad cold, bad enough for him to spend most of Sunday in bed, and I didn't think I was up to driving over to the race by myself as I was just four days post-op. I want to get some more video of them. There are some 5k's coming up I will go to. I want to get some racing video and some doing things like form drills and techniques.